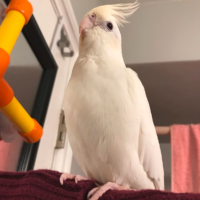 Vanilla (Nilla) is a 3 year old, female albino cockatiel. No band on leg. Bald spot behind her crest. Escaped from her home in Olivette, MO around 2:20pm on Sunday, April 14th, 2019. Friendly; may be a bit timid with strangers. Please call 8168044354 or 3148174275 if found.